- VISIBILITY. You will get a Business Profile Page on SSSCoupons.com w/ your current deals, company bio, hours of operation, link to your website, directions to your business and more! - CONTROL. 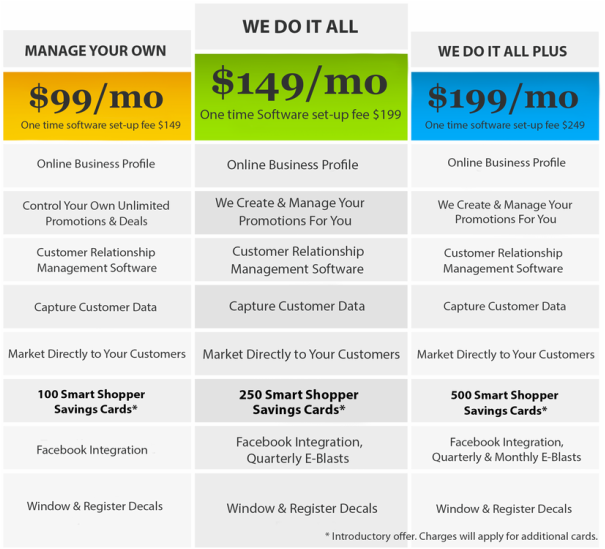 You can have full control over your deals and promotions or let us manage it for you. 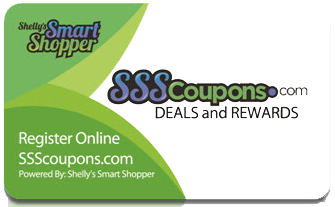 Deals can be daily, weekly, monthly and yearly and can be single or multi redemption. Loyalty programs such as buy 9 get the 10th free are also available. - CUSTOMER DATA. When shoppers use their card at your business to redeem their deal you capture their customer data including name, email, gender & birthday. Use this data to create targeted email marketing campaigns or let us do it for you. - ANALYTICS. See exactly who redeemed your deal, which deal and view coupon usage reports. Track average age groups, gender users. - MARKETING AUTOMATION. Our software can easily send automatic thank you emails to your customers. Add our SSS App to your business' Facebook page to display your business information and current promotions. Multiple offers can be created and managed with a few clicks of the mouse. Finally, keeping in touch with your customers and getting them to come back is a piece of cake! - INSTRUCTION. We've created a series of short instructional videos to help walk you through the back office software step-by-step.